Fabulously minimalist, the understated style of the Brushed Steel Breakfast Bar Stool Grey is undeniable. 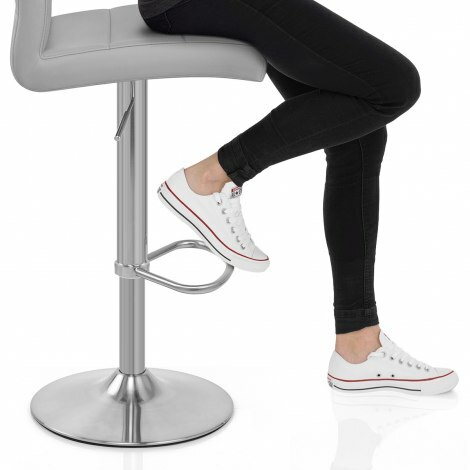 A wonderfully versatile and modern model, the Breakfast Bar Stool promises to bring a touch of class to any location and is not to be missed. Combining muted grey upholstery with a brushed steel frame, it is comfortable too. The seat is filled with high-density foam padding for a luxurious feel, plus horizontal stitching enhances the simple design of this model. The hand-brushed frame features an integrated gas-lift mechanism for adjustable height and 360-degree swivel movement, plus a neat triangular footrest is included for extra support. 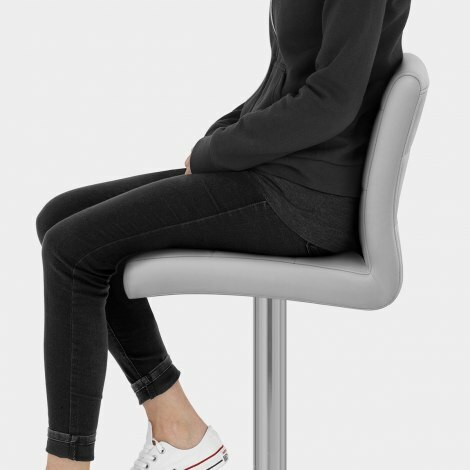 The rounded base of the Breakfast Bar Stool has a similar brushed effect, and a rubber floor guard is included to help to avoid damage to your surfaces. "Good quality stitching and very comfy"
I bought 3 of these stools to go round my new breakfast bar and we have a large open plan kitchen into the lounge & dining areas where they really compliment the rest of our furnishings . Good quality - really soft and comfy to sit on - I would recommend and not hesitate to buy again. Bought 2 bar stools from amazon and returned damaged. Looked at these and paid almost double but we'll worth it very good quality and nice looking. Love this item; bought two of these a year ago so was relieved to see they were still in stock so we could purchase an extra one! Great quality, easy to put together. Having just had a new kitchen and breakfast bar these stools are just what wanted . Everything about them is perfect . Ordering and delivery was EASY & SPEEDY !